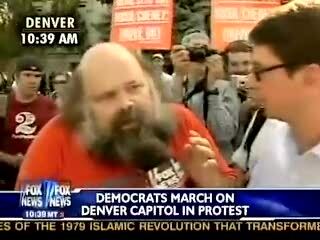 Griff Jenkins of Fox News was refused access to disgraced college professor, Ward Churchill. Jenkins finally spoke to a protester after several prior failed attempts from probable sabotage. Ahhhh, San Fran Nan and her Democrat cohorts in Congress. Gotta love the modern liberals, always open-minded and willing to look out for their constituents, er, their own best interests. You can fool some of the people some of the time, but Barack Obama is not fooling us. 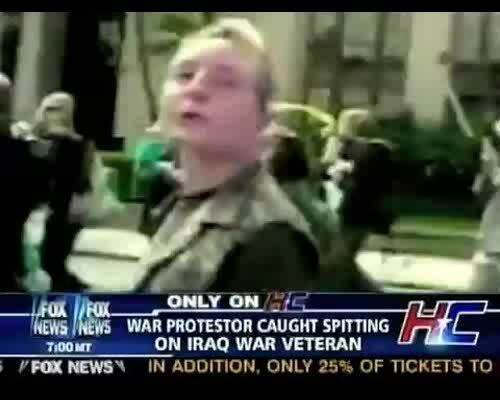 Hannity and Colmes showed video of an anti-war protester spitting on an Iraq War veteran during an anti-war march. Michelle Malkin contrasted the leadership experience of John McCain and Barack Obama at the RightOnline summit in Austin, Texas. She spotlighted Gen. Wesley Clark's laughable comments on the subject. Our weekly video blog on illegal immigration: The budget blues in California and elsewhere are 100 percent preventable if officials crack down on illegal aliens. Airport Security: End The Political Correctness! Anti-war activists have demonstrated the hypocrisy with their calls for "peace" by waging a campaign of violence against military recruiting centers all across America. On Jan. 29, the Berkeley City Council voted to tell U.S. Marines they were "unwelcome" and "uninvited intruders" into the city. The city refuses to apologize to the Marines.